welcome to my turn to the friendship quilt along. if you have been following this whole time and have been making the quilt as we go, welcome to the next one! if you are just hearing about it, it's okay i think i'm going to make this quilt this summer when i have a little more down time. maybe we can make it then together. if you've been making them make sure you place them in the flicker group! mine is block numero 31. follow the link to get the full instruction on how to make it. i chose to make my block out of my simply color pink ombre. i kind of have this thing ombre. find how to make these onsies here . find how to make this appliqued bag here. 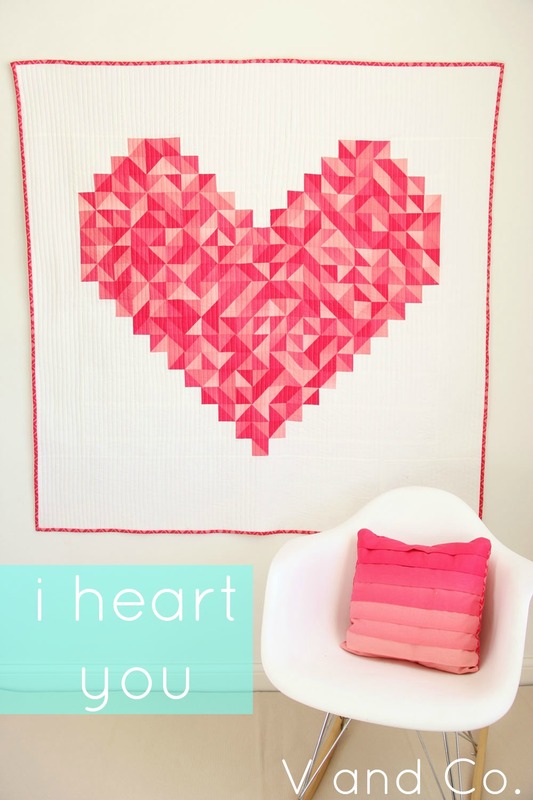 find the i heart you pattern here. as you can see in my first fabric line simply color and the second line coming this july simply style. You have the weekend to rest or sew these blocks. We hope you are having fun collecting all these quilt blocks. okay now, would you like some of my fabric to play with?? remember how i said i liked ombre? aaaaand some aurifil thread that matches my line. **tell me your favorite shape in a quilt. make sure you check out all the other designers to enter a chance to win in their giveaways as well! Labels: moda fabrics, modern applique, modern fabrics, modern quilting, my shop, ombre fabric, simply color by V and Co., simply style by V and Co. I think kaleidoscope is my favorite of your new patterns! I LOVE hexagons. I've only made a bag using them so far, but it was great fun to make, and I felt so accomplished when I got it done. 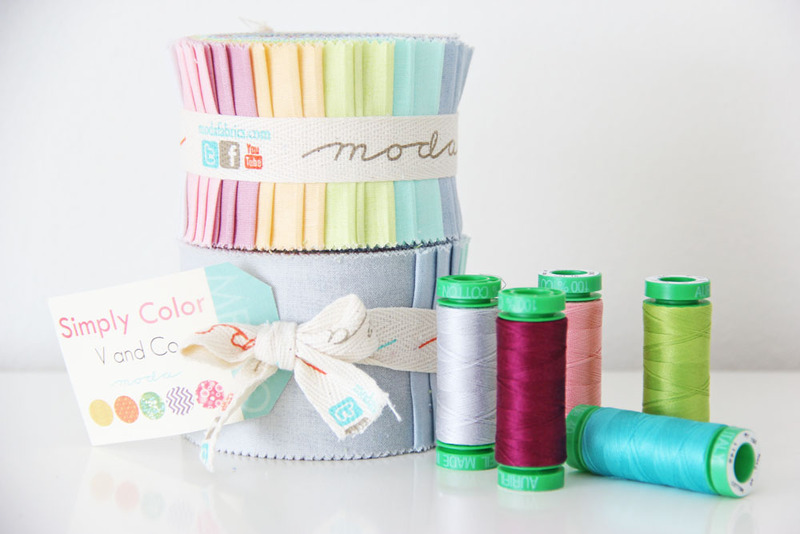 Definitely Confetti - it is gorgeous and I love baby quilts. I love hexagons! I made a queen size Grandmother's Flower Garden but it's not quilted yet. Thanks for the chance for your super give away! The Bubbles quilt is very soft and striking. So lovely! Thanks for the sweet block! They are all so pretty. But I would love the Color Block Pouches! I love stars in quilts! I think I'd like to try the Confetti pattern. Thanks. I am a lover of ombré too. I think I now have yardage of yor green and blue in my stash. Gotta get some pink. I love kaleidoscope! And I love stars and flying geeses and of course hexagons! I would love the Confetti Pattern! My favorite shape in quilts are circles or curves. I like patterns that appear to be curved even though they are straight lines, like the Storm at Sea block. The Hampton bag for sure! I love bag patterns! Fave shape...squares I guess. Quick and easy to cut! I love ALL your patterns. Hexagons are new to me; I'd give that a try. Thank you for a chance to win. A second chance? Thanks! I'm working on a mariner's compass BOM and finding it fascinating. It's easier than it looks; although it may get harder after block 4. I would have to pick Confetti. I love it! My favorite shapes are squares...or hexagons. I've been way too intimidated to attempt hexagons though. Maybe the Confetti pattern will help me tackle that fear. Kaleidescope. It's a very interesting combination of Lemoyne star with four patches that I've never seen before. Lovely! So pretty!! 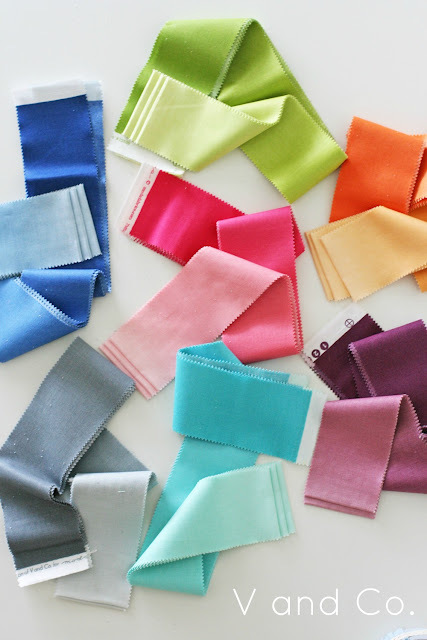 Your fabrics are just yummy!!! Love hearts! Those are my favorite shapes. kaleidoscope is my favorite of your new patterns. My favorite shape is a pointy circular design like Mariner's Compass, Sunflower or Chips and Whetstones. Also plain circles in interesting fabric. It will be fun to read other people's answers to this. Your block is so cute! Love your patterns but my favorite is kaleidoscope! My favorite quilt block to work with are the windmill block. I am also working on hand sewing yo-yo's and Hexie's. My favorite shapes are pinwheels! My favorite pattern would be Kaleidoscope and my favorite shape is stars. Thanks! I love all your patterns but I am most likely to actually make Hampton weekedn bag. Thanks for the awesome chance. Ooh love the second chance. I love all shapes in quilts, hexagons are maybe the top of the list - just. I love the Kaleidoscope pattern. I would love to make that quilt. My favorite shape to piece is a pinwheel. I have pinwheels in just about all my quilts. Not all, but most. Even if the original pattern doesn't have them, you can make a square out of hsq and have yourself a pinwheel to put into a pattern in place of a boring square. Hi! I love your fabric and I really love the kaleidoscope quilt pattern. I love star blocks, so I suppose my favorite shape is the triangle. Thanks so much for your bloc pattern....I have not been able to keep up but I am trying...Thanks so much for all your beautiful colors. The ombre well what is not to love....this is just beautiful fabric. Is love the color block pouches pattern.... Especially if you have some zipper tips in there! Circles are my favorite shape in a quilt... If I'm not making it. If I'm making it then rectangles! My favorite shape is hexagon! Love the simplicity of some pretty colors. My fav colors are also blue and green, I just started a sampler quilt in blues and greens! I love the Kaleidoscope quilt pattern. I think that's the one I would choose (though my eye keeps straying to the Hampton bag as well). My favorite shape in a quilt is a star. 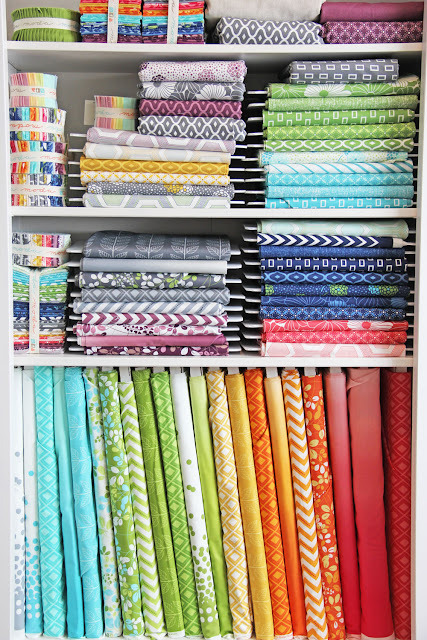 I love, love, LOVE star quilts. I think I'd like to try Kaleidescope. Thanks for the give away of great stuff! I'll try the Kaleidoscope pattern! Hexagons are looking interesting! Thanks for the project and chance to win. I've stuck with square shapes for the most part...but I'd like to get better at triangles! My favorite shape is a square... however, I would like to try hexagons! Definitely Kaleidescope! I would have picked your new heart pattern but . . . Great fabric line! Thanks for the chance. I love making stars especially if they are paper pieced. Love the look of hexagons but don't have the patience to sew all those by hand. :( Thanks for the chance. 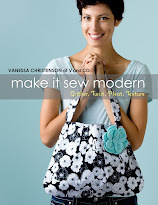 Love the fabrics - love the free pattern. My favorite of your new patterns is Bubbles. Thanks for the chance to win. I would love to win confetti! I love the hexis in the quilt. My favorite shapes are very basic like squares and triangles, even though I loathe triangles they're still a fave. I love your block - Thank you! My favourite shape is a HST!! so versatile. I love the kaleidoscope pattern! and my favorite shapes in a quilt are triangles--so much you can do with them. Thanks for the chance to win some of your gorgeous fabric! All of your patterns are great but if I have to choose a favorite I would say Kaleidoscope. I couldn't make up my mind about a favorite shape.I am new to quilting and haven't tried them all yet. I have been wanting to by the Hampton bag since it came out. I really like circles right now and pinwheels! Wonderful patterns! I would choose Bubbles as my favorite, so cool! It would be a thrill to win, thanks for the chance. I don't know that I could pick just one favorite shape in quilts. Lately I've done several patterns with rectangles, but who knows what's next? Kaleidoscope is my "NEW" favorite.Great patterns. I have my eye on making a quilt with Hexies I see so many great looking quilts with them. Oh I love these ombres! And I can't wait for your new line to come out. I would enjoy your color block pouches, thanks for a great giveaway. My favoriet shape to use in quilting is the veratile triangle -- boring perhapse but there is so much that cna be made. I am also loving improv piecing and this has no defined shape. Very nice! thank you for a chance to win. Those color block pouches would get so much use in my life! They are very stylish to boot! My favorite shape would have to be stars. They just pop so well if used just right! Thank you for the chance to win. Thanks for sharing your block.I think kaleidoscope is my favorite of your new patterns! Your bubbles design is delightful, thanks. Each pattern is just making me ooh and aha, great job. I love the Confetti quilt! I chose the Confetti quilt because hexagons are my favourite! Thanks for the contest! I would love to win the Bubbles pattern! I have lots of favourite colours too. I find that question really hard to answer! Your ombres are gorgeous! 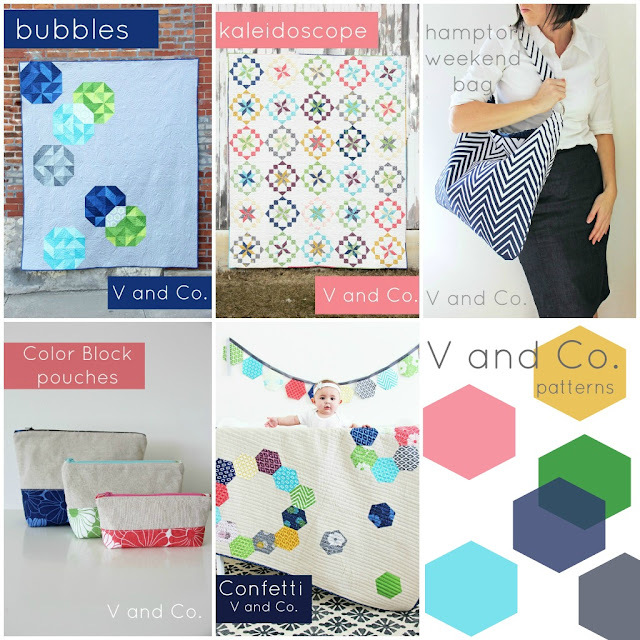 My favorite pattern from V. and Co. would be "Kaleidoscope." Thanks for sharing your block directions! I'm finding it had to pick a favourite shape in patchwork too! umm, probably triangles because you can make so many shapes out of triangles, eg stars, flower etc. I particularly love triangles when they are arranged in a chevron or zig zag pattern. I'd like to win confetti. My favorite shape in quilts would be stars and baskets. Thanks! I love dresden's, HSTs, and 2 1/2 inch squares. I'm crazy about the Kaleidoscope pattern - hope I win, or I'll have to buy! I would love a chance to win! My favorite pattern is the kaleidoscope pattern. And as for shapes ... HST's, squares and bricks... that's just a start ... I could go on and on! I like the new kaleidoscope pattern! Thank you for the chance to win! If I could chose one of these patterns I think I'd love the Hampton Bag pattern. It's super traditional, but I just love patchwork quilts. So, I guess squares are the shapes I like in quilts best, haha. This is followed quickly by circles. I would like to win kaleidoscope. And my favorite shape is a star! Kaleidoscope in Ombre would be incredible!! That's my favorite!! I love any shape that involves a point!! If I had to choose just one then, it would be kaleidoscope. And my favorite shape in a quilt is a star. I would love to win your kaleidoscope pattern. Oh, wow, what choices!! All pattern choices are cute!! I like "Confetti" the best. Thanks for your generous giveaway. The kaleidoscope and hampton patterns have my heart...I cannot decide between them! Love them both. My favorite shape in a quilt today is stars. Hmmm, tomorrow could be tumblers or hexagons, but today it's definitely stars!! I'd love the bag pattern. Favorite pattern is hard to pick maybe Kaleidoscope, but the color block pouches are a very close second. I love the bubbles pattern. kaleidoscope is my favorite pattern, have a baby quilt on the horizon that would be perfect in this pattern. my favorite shape used to be triangles but now I am starting to love hexagons more! I would love to win Kaleidoscope! What a fun and happy quilt. Thanks for the chance! I love stars in quilt. I'm a sucker for any pattern with a star in it. I mostly select squares when looking for a pattern, it is my safe zone but really like the look of hexies. Really want to give that a try. Stars! Definitely stars! So versatile! I love your Kaleidoscope pattern! I like the Kaleidoscope pattern. Confetti is also very cute but I haven't experimented with hexagons yet. Your block is so sweet! It looks great with your ombre fabric. I'd love to get confetti. Stars are my favorite shapes to use in quilts . . . there is so much you can do with them. I think that kaleidoscope is my favourite. It is so cheerful. My favourite shape - in quilts anyway - is the triangle. So many permutations and so many different designs can be made from them. this block is awesome! i see many made into the centre of log cabin blocks done in reds pinks and whites and then your I heart you pattern done for the back --haha! 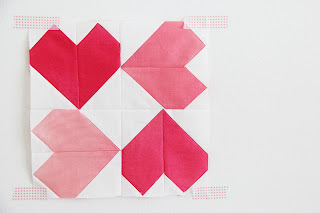 reversible valentine's (or anytime) quilt! I love the color of Simply Color! I'm torn but I think I would choose Kaleidoscope. I love stars in a quilt! they just feel perfect in all styles. I really like hexagons so confetti would be a good choice. I really like the pattern Confetti. That would be fun to make and to give to my niece. Thank you for another great block for the friendship quilt. To win your ombre jelly roll would be just awesome. Thank you for giving all of us, your followers, a chance to win. I am not really talented to be doing circles or hexagons. So, I try to stick with squares and rectangles. I am making a blue baby quilt with triangles. But,I feel more comfortable with the squares and rectangles. Just really enjoy your blog. Love the block!!!! My favorite is kaleidoscope...can get a lot of wonderful colors in it..thinking about those vibrant jelly rolls. If I had to choose just one, it would be kaleidoscope. Love the fabric! I love the weekend bag!! I love the kaleidoscope pattern the best! ooooo.... hmmm.... pick a favorite... tough... I loke them all.... I think I would have to say Confetti... and perhaps bubbles... what can I say, I love them all! Beautiful new line, and LOVE your first as well! THanks for the chance to win! My favorite shape in a quilt is a star, but hexagons are a close second. Thanks for your friendship block pattern! I am a big fan of stars, although hexagons are coming in a VERY close second! Thanks for the chance to win! I love the confetti pattern. Thanks for the block and the giveaway. I think that Kaleidoscope is my favorite! But the Confetti would be a very close second! Great block!! Thanks for sharing! I think I'd go for Bubbles but it's such a tough choice! I love your Kaleidoscope pattern! Thanks for the cute block pattern and the chance to win. I really like the kaleidescope pattern. I love stars. My fave shape in a quilt is hexagon, they are not my easiest to do but I love how they look. I like the kaleidoscope. Very pretty. I have a thing for circles or curves. I'm getting ready to try a curved pattern. Those pouches are cute! Very doable for me. My favorite shape is simply the rectangle. I like Kalidoscope! I love the stars. Kaleidoscope is my fav! Love that! As a newbie quilter I think hexies are a bit much for me yet but I am having fun with anything with 3 or 4 corners! RIght now, I love hexagons. 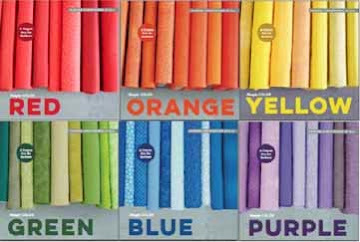 I am working on table runners for my dressers right now in Simply COlor! I love all different shapes in quilt. Lately, I have been enjoying boring old squares. You can do so much with them. Thanks for sharing. My favorite of the patterns is Kaleidoscope! My most favorite shape in a quilt block is a star shape (although lately I have been drawn to simple 9 patches). Thanks again! Confetti looks like great fun! Thanks for the chance to win. I think I would want the hampton weekend bag pattern...so fun! I am currently loving hexagons but it changes daily! Tough choice, but I think I like your bubbles pattern---and my favorite shape in quilting is circles! Love your blog, btw. Bubbles is my favorite - it's contemporary but respects traditional forms....a Transition quilt. I in desperate need for a new bag, so your Hampton bag has caught my eye!! Loving your new lines of fabric...so so beautiful :) Thanks for the chance to win! I love Confetti! I'm pretty sure it's because of the quilt itself, although that baby is also pretty cute. My favorite shape in quilting is the triangle - by varying colors you can create lots of eye-fooling shapes. But I forgot---my very, very, very favorite is the sashing strip - lots of color and no seams to match. Am I boring for loving creative uses of plain old rectangles in my quilts? They can make some awesome geometric blocks!! 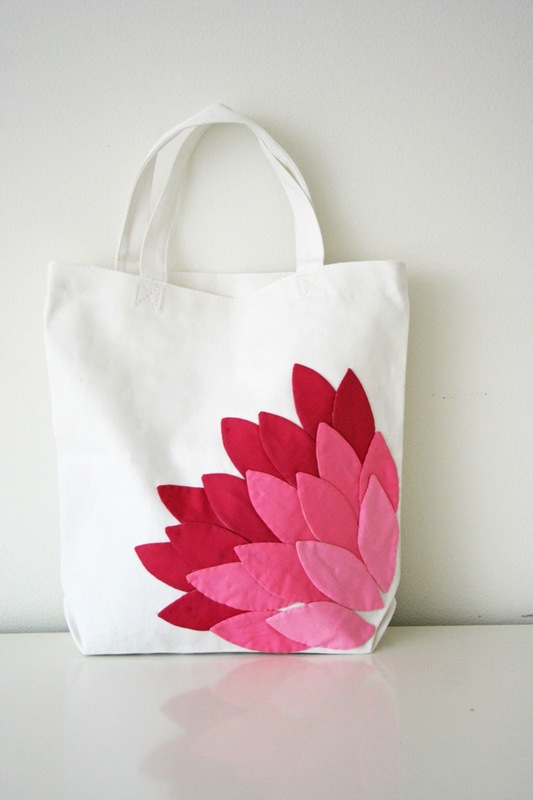 Add in some of your ombre fabric and it looks so pretty :) Thanks for the chance to win! I think the square in square shape is my favorite. Modern, but simple. Confetti is my favorite! I actually pinned it the other day as the next quilt pattern I need! Thanks for the chance! LOVE that you LOVE color! I love the pink hearts! I pick the "Confetti" it is different then I work with. I love doing stars, so it is good to jump out of your box from time to time! I love your shelves of colorful goodness! My favorite of your new patterns is Kaleidoscope! Though I really like that heart pattern also! Love the Hampton weekend bag!Thanks for the chance to win--you ARE cool like that!